Fiddles, fiddlesticks and fiddling, can't get enough of it! Welcome to my world - that ever so slightly indulgent world of the fiddle enthusiast! Born in Papua New Guinea in 1969, I spent my childhood years in the North Queensland township of Cairns. At the age of ten, I told my parents that I wanted to learn the violin. Once they had regained their composure I embarked on a classical string program at my school with a fabulous teacher, Marjorie Duffy. I loved it, even though I wasn't particularly gifted and I would practice every day until I had driven every one crazy. I daresay nothing has changed in that regard. My parents played piano for their enjoyment and loved classical music but it wasn't until I was fifteen, upon attending the Yungaburra Folk Festival, that I was first exposed to folk music. It really excited me. 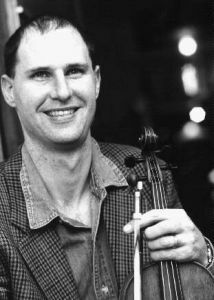 I spent my high school years leading a musical double life by going on Cairns Youth Orchestra tours and attending classical music camps whilst also performing folk tunes at the Cairns Folk Club and busking at local markets with my mate Ian MacConnell. As a keen school student I was focussed on studying biological sciences. However, due to my family's financial situation I needed to work before attending University and while day-gigging as a surveyor's labourer for Qld Main Roads I was converted to the musicians life, never to attend University till much later on. really good professional position was with country swing band The Barron River Drifters. From fellow band members Garry Steele (piano and piano-accordion) and Steve Gilbert (harmonica) I discovered much about the art of performing and improvising in swing, jazz, and blues. My next position was a two-year stint with the contemporary folk group, Mangrove Jack. I joined at the same time as fantastic bassist Gary Ward. The band was popular, recorded two CDs of original material and was performing 4-7 local gigs a week as well as featuring at National Folk Festivals. As a 19 year old I thought this music life was pretty lucrative and good fun. In Mangrove Jack I really learnt how to listen and play tightly with others, especially from fellow members Gary Ward and guitarist Peter Ella. Mangrove Jack also gave me a platform to unashamedly try stuff out in my solos. I'm sure some of it was pretty rank but I got there in the end. I also met through performing with Mangrove Jack my lovely wife Adriana who came to listen to us one evening. At 21 years old, freshly engaged and with Adriana a newly graduated schoolteacher, we decided to leave North Queensland and headed for the big smoke of Brisbane. I was ready for more musical adventures. We settled at Mapleton and Bill Hauritz took me under his wing. He introduced me to people, found me gigs and has always 'looked out for me' over the years. Bill introduced me to his long time buddy, musician Steve Cook, and that was the beginning of a partnership that is now 14 years old. Steve is especially adept at providing strong interesting rhythmic accompaniment behind all styles of music, but more importantly, behind fiddle music. I was really able to explore all the various styles of fiddle music I had been listening to. We formed a duo called Mystrel and our repertoire included Texas fiddle, bluegrass, swing, blues, country, folk, and acoustic versions of contemporary music. We performed all over the Sunshine Coast and at the Folk Festivals. The duo expanded its line up all the time trying out different sounds. I was also exploring rock violin with Andy Tainsh and Trish Cooper in their group called Bahgdad Café. All this experience finally led me to audition at the Queensland Conservatorium of music to study Jazz violin. There I met inspiring lecturer, arranger and musician, Bernie Allen. He showed me how to get bebop phrasing on the violin and how to approach the music. I completed the associate diploma and continued working with Steve. Then our group Mystrel got put on hold after Steve had a tragic car accident on the way to a gig. Hospitalised for months my longstanding music colleague was out of action and I was out of work. It so happened that multi-instrumentalist Ceri McCoy and uillean piper Dave Goldsworthy were looking for a fiddle player for their Celtic group Jack the Lad. I hadn't been playing much Irish music in a serious sense since I left North Queensland and I really enjoyed getting back into it and fell in love with it all over again. It was a great group. Ceri being such a diverse and accomplished musician had many interesting approaches to the traditional music. Eventually Steve Cook joined the group playing bouzouki. We performed around Brisbane and at Woodford Folk Festival many times. In 1997, looking for a change, Steve and I founded a group with singer Suzie Fish called Tulca mór. It soon developed into a quartet with great Uillean piper Adrian Jefferies. The band performed at The Port Fairy Folk Festival, The National Folk Festival, and of course Woodford Folk Festival. In 1999 we recorded a CD, Rise a Mile. By now I was hooked on Irish music and rather than doing all styles of music, I wanted to concentrate on just two styles: Irish fiddling and Jazz fiddling. This goal led to a reincarnation of Mystrel with Steve on mandolin, originally Jamie Clark on guitar (later replaced by Ewan MacKenzie), and Peter Walters on double bass. Mystrel now performed original instrumental music that tapped into many folk and jazz idioms. At the same time I had been playing with a great banjoist from Ireland, Ciaran O'Connell who had replaced Adrian Jefferies in Tulca mór. He went back to Ireland in 2000 and Steve and I followed for two months. That was fantastic!! I played every night all the way up the West Coast and back. I learnt heaps. Upon returning to Australia, Tulca mor reformed as an instrumental group with new recruits Andrew Heath on guitar and Claire Fitzpatrick on button accordion. I have never had so much fun performing Irish music as with these guys. We now have the fabulous Jenny Fitzgibbon with us as well. The band is going from strength to strength with its second CD and getting recognised nationally for its performances. I also started studying nursing as Adri and I now had a child and another on the way. I couldn't rely on music alone and yet now that I am working as a nurse, music is as busy as ever. I'm exploring jazz fiddle with Ewan Mackenzie's manouche swing group Mystrey Pacific, performing Irish with Tulca mór and last year was kindly offered the opportunity to musically direct the Woodford Fire Event. I feel very privileged to have been around such great people in music and to have been supported by so many local folk enthusiasts in Brisbane and the Sunshine Coast.